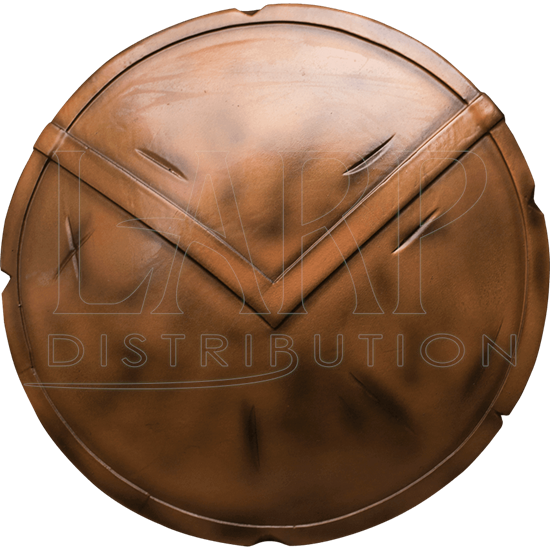 Hand-painted with a bronze finish and sculpted with battle scars, this round shield takes inspiration from the tale of Greek king, Leonidas I and his Spartans. Reenact the Battle of Thermopylae with the LARP Spartan Shield in hand. Offset trim runs along the rim of the shield, while metallic bands form a V across the upper half. The inner side of the shield features a horizontal handgrip. The handgrip is one complete unit with a leather handle and an adjustable arm strap built into the frame for maximum shield control.